Petrofac E&C Oman has Celebrated the scholarship agreement with Sultan Qaboos University to sponsor students in Postgraduate Programs during the academic year 2018-2019.Three Omani students enrolled for the Master (MSc) program in Mechanical Engineering, Chemical & Process Engineering, and Civil Engineering faculties of the College of Engineering at the University. Commenting on the sponsorship agreement with SQU, Ray Richardson, Petrofac’s Country Manager said: “We welcome this further step in the long-standing relationship between Sultan Qaboos University and Petrofac. Many high-quality graduate engineers from the University have developed successful careers with us and we look forward to further opportunities wherein the synergies of close academia and industry cooperation can be realized. 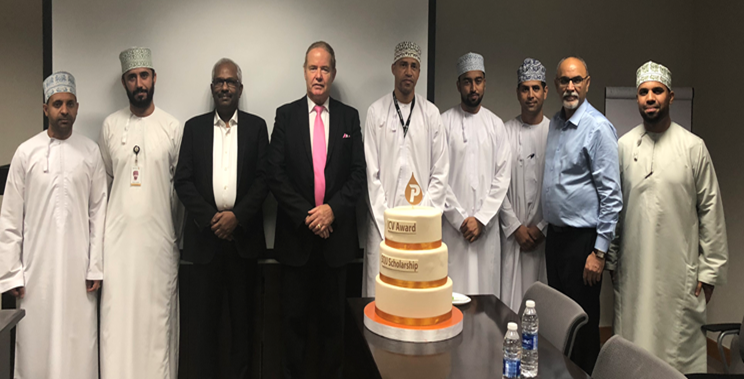 On the other hand, Petrofac E&C Oman celebrated the ICV award which they received from Petroleum Development Oman (PDO) for their outstanding performance. Swaminathan, Vice President and Project Director for Yibal Khuff, attended the ceremony: “Receiving this important award from our client reflects the ongoing excellent work by the team in achieving our ICV targets and always aiming for continual improvements. I’m delighted for everyone involved”.